Pinterest is a wonderful thing, isn't it? I find so many wonderful things and ideas, it's insane. 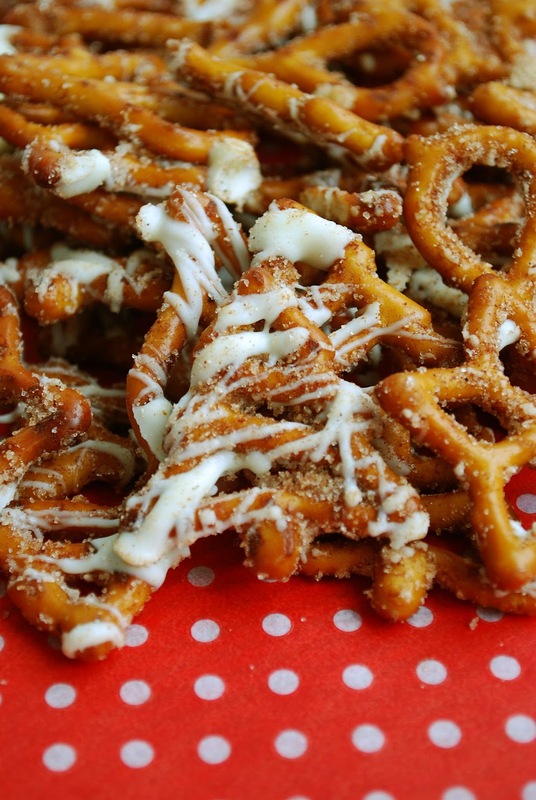 And speaking of insane, these white chocolate cinnamon sugar pretzels are just that. Totally perfect for Christmas, especially with these Utz Holiday Shaped Pretzels I found at Wal-Mart, this snack will be the easiest, most addictive treat that everyone will gobble up. In a mixing bowl, whisk together the oil, sugar, and cinnamon. Pour pretzels into a large microwave safe bowl and pour in the oil sugar mixture. Stir until coated. Microwave for 1 minute, remove and stir. Put back into the microwave for 45 more seconds. Stir again just to make sure that everything is coated. Spread the pretzels evenly onto two cookie sheets covered with parchment paper. While the pretzels are still warm, sprinkle the cinnamon sugar generously over them. Melt the white chocolate chips (on low heat) and drizzle over the cooled pretzels. Store the pretzels in an airtight container. I love a salty and sweet combo in my snacks and those Christmas pretzels are too cute! This sounds really yummy - I loves me some salty/sweet snacks!! Salty/sweet is pretty awesome and this definitely gives you both. I just made white chocolate peppermint pretzels, so I know these are gonna be good! Oh wow! Those pretzels sound really good. They are really good! And so easy.